The publication of this work undoubtedly marks a major step in our understanding of the cactus family. It is is the first major comprehensive work since the publication of Backeberg's six volume Die Cactaceae. It is also the first to bring together a considerable body of scientific work on cacti which has been possible with new tools of molecular biology. Plant taxonomy faces a big problem in that the naming systems it produces is used by people with widely differing needs. The botanist needs a system which can reveal how plants and groups of plants are related and might have evolved while the horticulturalist needs labels for plants which they will be producing and distributing which will distinguish plants of differing appearance and attributes. Trying to combine these roles into a single classification systems inevitably produces conflicts and results in compromises. This must be done however as the mess which would result from two naming systems does not bear contemplation. From my point of view of somebody who has a scientific background but not in a botanical area I would have said that this publication provides a good balanced view of our current state of knowledge. There are many areas where further work is required and indeed this is fully acknowledged in the appropriate places. As is always the case it is no good waiting until all work is completed as this is a sure receipe for never going to print. While the book is substantial (over 700 pages), it is only a single volume and therefore cannot perhaps go into such minute detail on individual species as for example Britton and Rose did in their four volume work or even for example Benson's Cacti of the USA and Canada which is a similar size but of course only covered a fraction of the number of species of the current work. I think this is a reasonable compromise because if the work contained more detailed descriptions and perhaps more illustrations it would have put the cost beyond the reach of many potential users. I beleive this book is an essential publication for anyone seriously interested in Cacti because it provides a framework to fit in any more detailed information. My only reservations about the taxonomy which is presnted is that we seem to have at the moment rather large and unwieldy aggregrate genera for some of the South American groups of cacti compared to those of Mexico and the USA. I am not sure if this is due to our state of knowledge or to genuine problems in drawing dividing lines. While the book is primarily about classification and description of the plants of the cactus family it does also have chapters on Dr Anderson's particular interests of conservation and ethnobotany and the most extensive compilation of common names for cacti which I have ever seen. It also contains a list of Botanic Gardens and Herbaria with significant collections of Cacti, a substantial cited literature list and a glossary. The additional chapter on cultivation by Roger Brown struck me as a slightly odd inclusion. No disrespect to author as the advice given is perfectly sound and well thought out and presented but it is quite a small chapter and of course similar information is available in many other cactus books. 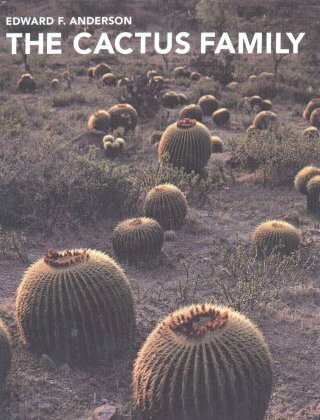 The other problem is that this book will be used by cactus growers from all over the world under an enormous variety of growing conditions which makes giving generally applicable cultivation advice not an easy task. At a guess the publishers may have been a bit nervous about publshing a cactus book without some cultivation advice. I think however that the vast majority of people purchasing this book will already have other cactus and succulent books. I strongly recommend cactus growers to buy this book. For a serious work on the group it is very readable and you will find it an indispensable reference work. If you cannot afford it try to persuade your local cactus club to buy it for their libarary and borrow it.